On Sunday I participated in the Color Me Rad 5K run (walk). 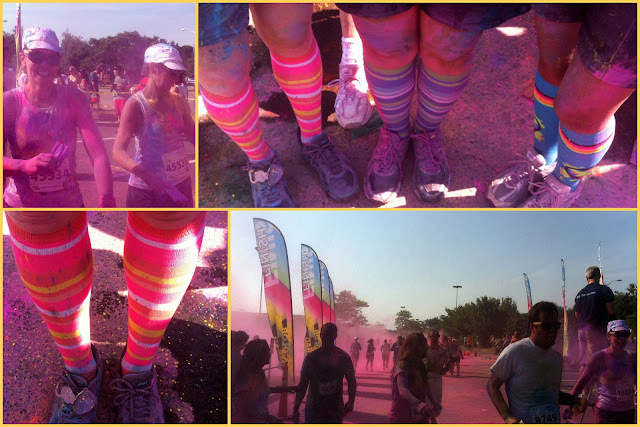 I had heard all about these "color runs" from bloggers and thought it looked like so much fun. 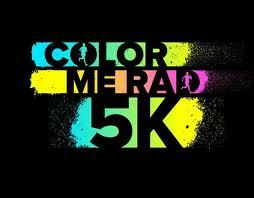 Of course I don't run so I didn't think I could participate. Then I found out that it is ok to walk. I found out my friend Julie (one of my fellow MS models) was walking Color Me Rad with some of her friends and she invited me to join their team. And now I'm going to let the pictures do most of the talking. . . So basically it works like this. . . you wear a white shirt. 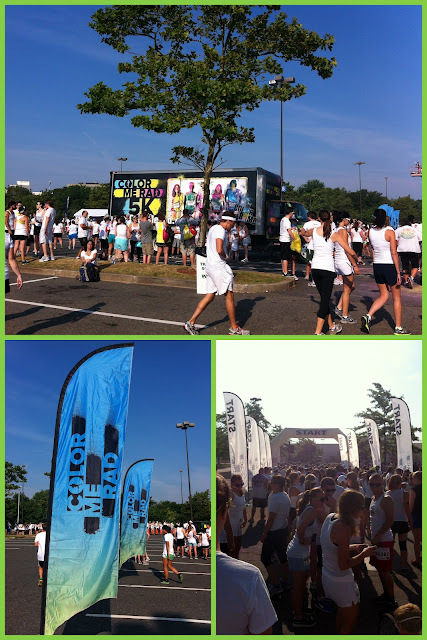 You run walk along a route and go through "color stations" which are each a different color. 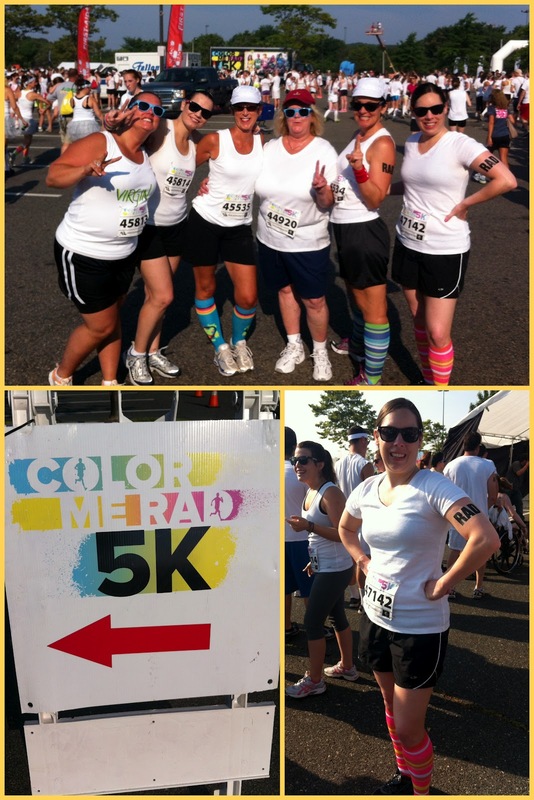 You get color bombed and then your shirt is no longer white! The color is both liquid and powder depending on the station. 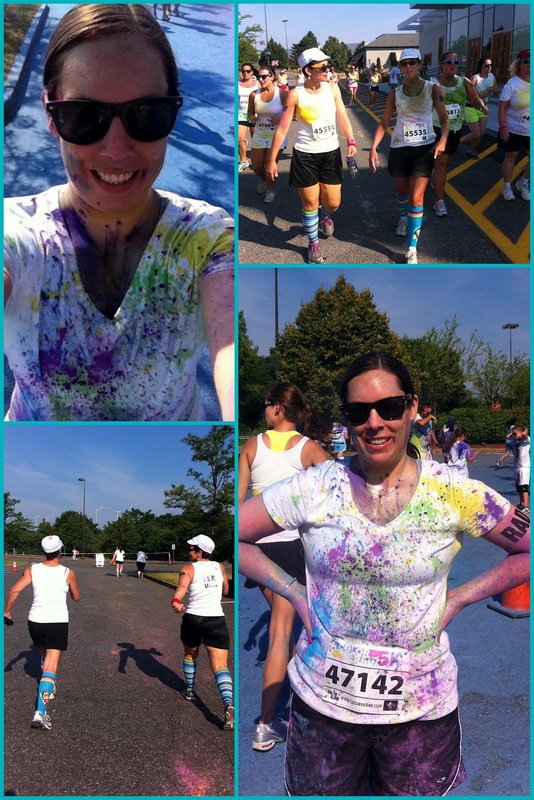 Volunteers spray and throw color on you as you go by (many people were literally rolling in the pavement to get more color on them)! As you can probably see this is a good time. It is by no means a competitive race. It is just stupid fun! People are goofing off and taking lots of pictures the entire time! Everyone just wants to be colorful so the more color the better. At some point near the end of it I got very colorful. . . the funny thing is you are looking at everyone else and thinking how fun they look but you have no idea what you look like! This was a different experience but fun. I would recommend it if it comes to your city. It was very hot and the lines to pick up numbers and start were long but other than that it was just a good old time. We attempted to do a jumping shot but we were hot and tired so this was the best we could do! Ha! And how about my hand once I removed my band-aid. Too funny. We are still waiting to get the "professional" pictures that they take. 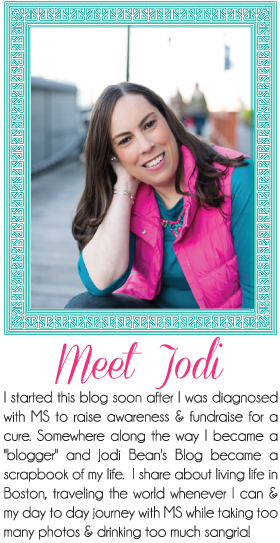 So if there is anything good I will share those once they are posted. In addition to the shirt I wore (which looks really cool) they gave us a nice fitted/women's shirt. 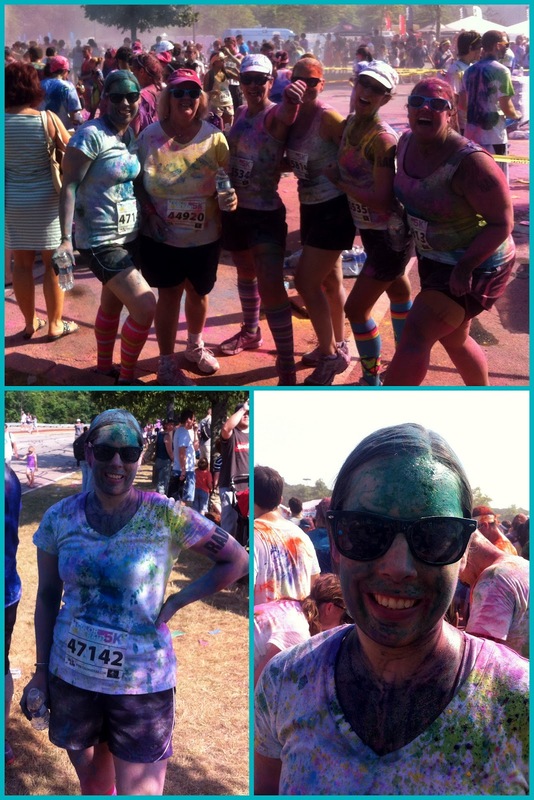 They also gave us sunglasses to wear during the race which I'm glad I did b/c they were covered in color. In terms of removing the color I thought it would be much harder than it was. I forgot to bring a towel to sit on in my car on the way home but it actually was ok and really didn't come off on the seat. I showered as soon as I walked in my house and had to scrub in some areas to really get the color off. I shampooed my hair 4 times just to be safe and that worked well. My shower and bathroom still have some dye which I need to clean but other than that pretty easy color removal! 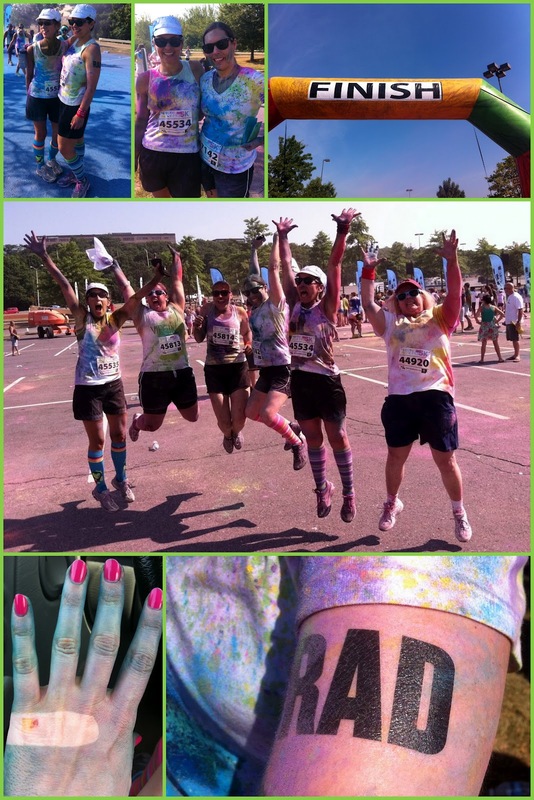 Have you ever done Color Me Rad or a similar event? What did you think?